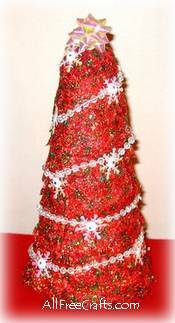 Spiral ribbon around a styrofoam cone to make these pretty little Christmas trees. Here’s an easy Christmas craft to make in less than an hour, yet the results are very pleasing. All you need is ribbon, in the colors and finish that best suits your decor, plus an ordinary styrofoam cone. Once the ribbon is in place, you can decorate your tree with strands of beads, mini garlands, holiday confetti or miniature Christmas ornaments. Pin the end of the ribbon near the bottom of the cone, so that the hem of the ribbon just touches the table as you begin to roll it around the styrofoam cone. The ribbon that I used is fairly see-through, so I had to take the ribbon around the cone twice on the first row for adequate coverage. For the second and subsequent rows, keep rolling the ribbon around the cone, overlapping the row below by at least &frac12 inch. Keep going like this until you are near the top. If the styrofoam cone that you use has a flat top like this one, roll the ribbon around this area until it is covered completely, then pin the end of the ribbon in place to secure. Pin or glue a little ornament or miniature gift bow to the top of the tree. At this point, if you’re not planning to add further decoration, your tree is finished. Just display on the mantle or side table and enjoy. But – if you’d like to add more, read on. Pin the top of your garland to the top of the tree and begin winding the garland in a downward spiral, pinning as needed to secure it, until you reach the bottom. Pin the end. To add snowflake and sequin details, slide a pin through the center of a sequin, then through the center of a small snowflake embellishment. Pin at various points on the garland from the top to the bottom of the tree.